Since 1974, Satanta Electronics has been providing installation and service on cutting-edge technology in SW Kansas and the surrounding area. 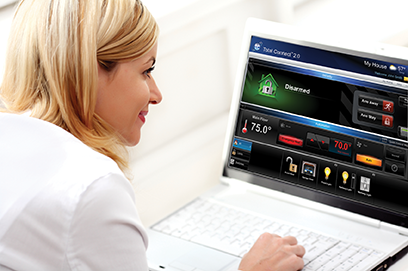 Today, those technologies allow us to secure and protect your home and business with real time access and notification. With product offerings from Honeywell, Panasonic, FLIR, Samsung and Yamaha, we can provide custom solutions with unrivaled technical support. High-definition surveillance systems deliver high-resolution video recordings that are viewable locally or over the internet. Our systems are acccessible with free apps for Android, iPhone, iPad and computer. New MPX surveillance systems provide an inexpensive upgrade option for owner's of older systems wired with coax cable. With a Lynx 7000 controller or Tuxedo Touch touchscreen keypad, your new alarm system can combine intelligent security solutions with a convenient display of compatible security cameras. These 7" displays allow you to always see who's at the door before you open the door. The system functions and video displays can also be mirrored on other devices including smartphones, tablets and computers. Satanta Electronics also installs Z-Wave compatible lights, thermostats, door locks, and water valves. These integrated systems allow you to view a visitor at your front door, disarm the alarm system, and unlock the door, whether you are in the den at home or on vacation hundreds of miles away. 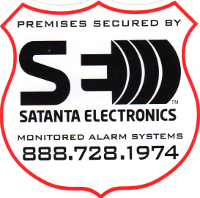 Satanta Electronics installs Honeywell alarm systems featuring the Alarm Net services package. One part of this service is the exclusive Total Connect protection package. 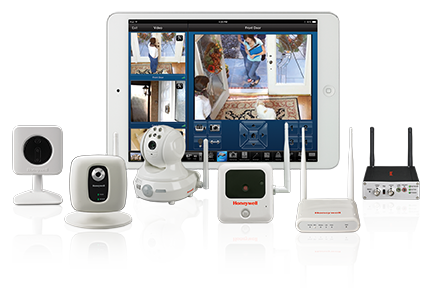 With system control apps available for iPad, iPhone, Android and computer, your security system is at your fingertips no matter where you are. You can easily check the status of your system from your car and arm or disarm from any smartphone or device over the cellular network or internet. Due to the the constant communication link through Honeywell's Alarm Net system, you can receive instant text alerts from your system. These text alerts can inform you when your system is armed or disarmed, or when a zone is violated. Custom detection devices allow you to monitor valuable assets such as gun cases or jewelry boxes. You can be notified directly if a cabinet is opened or a valuable item is moved, whether the system is armed or not. Notifications could even include the approach of a vehicle over one of our driveway alert sensors.